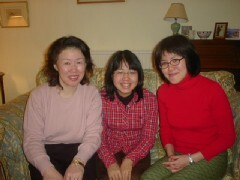 Chie's Mum and Sister came to stay in the UK over Christmas and New Year. Yoko-san and Yuka-chan arrived from Japan and we headed to South Wales to stay at Vera's house, who was actually away (in Dartmouth?) for the Christmas week. Dad took me, Chie and her family out for a drive, including the Blorenge (I think) where we saw some snow. Later on Alex's birthday dinner in The Narth. 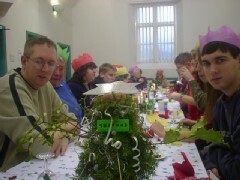 Christmas Day lunch at the village hall in Trellech, then back to The Narth in the evening. The Boat Inn and Symonds Yat. I assume we went back to London today...? Back in London after Christmas. Surprisingly it snowed. I think the girls must have gone sightseeing in the daytime without and I stayed home. Went to the ballet in the evening. Looks like I again left the girls to do their own thing and I met Rob in the afternoon for a bit. 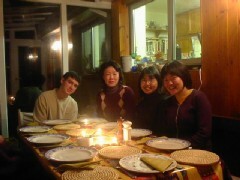 Had dinner at my flat with Yuka-chan and Yoko-san. New Year's Eve, decided to stay in. Early afternoon stroll across Hampstead Heath before taking Yoko-san and Yuka-chan to the airport.